Hypothyroidism in Dogs – What Are the Signs? I am sharing Sephi’s story with you in order to save the time and money I ended up spending to diagnose and treat Sephi’s Hypothyroidism. If me or my vet had known what to look for, I would be over a thousand dollars richer and Sephi would not have had to suffer damage to her liver. Sephi is none of the above listed breeds (as far as I know) but she is middle-aged. She didn’t seem to exhibit a decrease in energy or weight gain or most of the other symptoms listed above. The only symptom she had was hair loss and skin sores. When we went to the vet, she was tested for bacteria, mites, and allergies. But the vet didn’t even think to check for Hypothyroidism in dogs. All the results were inconclusive so the vet sent us to a vet which specializes in dermatology in dogs. Tests were done and a bacteria was found. However, the only treatment for this bacteria was a strong medicine often used on horses. Sephi took this medicine as the vet directed, but here were no changes in her skin condition. After about two weeks on this very powerful medicine, Sephi began to show other very bad symptoms. There was vomiting and diarrhea – sometimes with spots of blood. And she was very lethargic. So much so that she didn’t want to go on her walks. I thought it was a new symptom so I took her back to my regular vet rather than the specialist. I had no idea it was related to the medication she was taking. But the vet said that the medicine was taking a toll on her liver. They kept her overnight and took her off the medication. The first week back home, Sephi remained tired, but the nasty symptoms of vomiting and diarrhea disappeared. Soon, Sephi was back to her old self – all except for the skin issue. The skin issue remained. A few weeks later, I took her to the vet again. Since I decided that the very expensive specialist was a waste of time and money, I took Sephi back to her regular vet. Our vet hospital has multiple doctors and this time, Sephi was seen by a different doctor. This veterinarian immediately suggested Hypothyroidism in dogs. After a short, easy, and inexpensive blood test, the vet found that the T3 and T4 thyroid levels were slightly lower than normal. She gave me a presciption which I was able to fill a 6 month supply for $50.00 at Walmart. The multiple vet visits, expensive prescription which damaged Sephi’s liver, and the treatment for the liver damage cost me over a thousand dollars. Compare that to the under a $100.00 for diagnosis and prescription for Hypothyroidism in dogs. It is quite a difference. If only the first veterinarian I spoke to had the savvy to look for Hypothyroidism in dogs to begin with, I could have saved a lot of money. Sephi’s skin condition improved within one week on the Hypothyroidism medication. Her liver healed completely and she is once again a very happy dog. While Sephi did not suffer weight gain, weight gain is a common symptom of Hypothyroidism in dogs. If your dog is middle-aged or older, suffers weight gain, loss of energy, or infections of the skin or ears, have your vet check for Hypothyroidism in dogs before going to a specialist which may cost you hundreds of dollars. Winter is almost over and the weather is warming up. It’s time to take our dogs to the dog park again. But before you do, check out this article at OregonLive.com. OregonLive has lots of great tips to re-introduce your dog to the dog park. While mommy and daddy are on their honeymoon, Sephi and Maya will stay home – or close to home. Sephi is staying with mommy’s good friend while Maya will stay at a boarding kennel. We couldn’t find someone to take care of both our dogs so we considered their personalities and decided that Maya would be the one who would do better in a boarding kennel with a doggy day play. Before you board your pet, you need to consider your dog’s personality. Is your dog okay being by themselves for long hours? Or do they need a lot more attention? Maya needs more attention and exercise so we chose a boarding kennel with a doggy day play. That way, Maya can sleep all night and play all day. If your dog needs more attention but won’t do well with other dogs, consider a dog-sitter. Or if you do a boarding kennel without the doggy day play, be sure to ask how often the dogs are walked or let out for playtime. When choosing the boarding kennel Maya was going to stay at, we looked at reviews online and visited the boarding kennels in person. We also asked about their health requirements and emergency care procedures. If you are considering a boarding kennel for your dog, you want to make sure that the kennel requires all dogs be current on their shots. You especially want to check to make sure that the boarding kennel requires vaccines for Bordetella. Bordetella may not be a regular vaccine provided by your vet, so you may have to take your dog into the vet for this before you board them. Good Luck on this Saint Patrick’s Day! 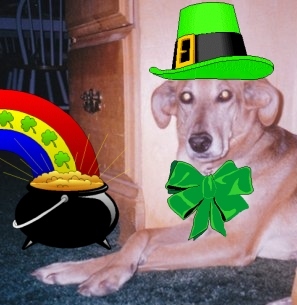 A Golden Retriever is more valuable than a pot of gold. 1) Which type of terrier has a longer body and longer legs than of any other AKC terrier breeds? Irish Terrier – the only colors of this breed are red, red-wheaten, or wheaten. 9) Which AKC dog breed has the softest, silkiest, and waviest terrier coat and comes in a blue color? Kerry Blue Terrier – named for County Kerry, Ireland where they originated. 10) What do all these AKC dog breeds have in common? They’re all Irish! 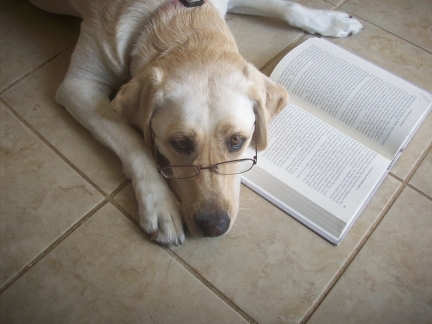 See if you know or can find the answers to the following questions about AKC dog breeds. One dog breed will be the answer to two questions. Figure out the fun final answer and you will learn what inspired us to write this. The answers will be given on our blog in the next couple of days. 1) Which type of terrier has a longer body and longer legs than of any other AKC terrier breeds? 2) Which red and white dog breed (white with red patches) was recently recognized by the AKC in 2009? 3) Which AKC dog breed is nicknamed “the clown of the spaniel family”? 4) Which AKC dog breed was originally bred to run the wheel of the turnspit of a hot kitchen? The turnspit is a wheel in which the dog runs in order to turn the meat cooking over the fire. 5) Which AKC dog breed was known for its large size and for its ability to hunt wolves? 6) Which AKC dog breed in the Sporting Dog Group has a rat-like tail covered with short curls (almost looks hairless)? 7) Which old terrier AKC dog breed is not only good at hunting vermin but is also a great all-around farm dog who is good at guarding and herding? 8 ) Which AKC dog breed in the Sporting Dog Group started out as a red and white breed but came only in a solid red color in the late 1800s? 9) Which AKC dog breed has the softest, silkiest, and waviest terrier coat and comes in a blue color? 10) What do all these AKC dog breeds have in common? 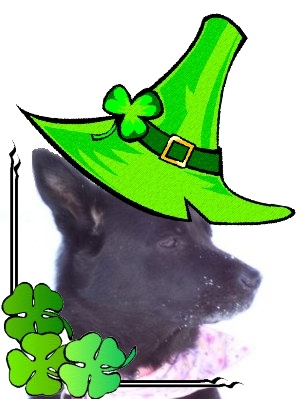 What better way to celebrate Saint Patrick’s Day than to learn about a dog with a royal Irish history. Perhaps you have heard of the Irish Wolfhound because it is the largest of dog breeds, but do you know why they are called Wolfhounds? Did you know they were commonly found in the field or at the hearth of ancient Irish kings? The Irish Wolfhound appears often in the ancient legends and lore of Ireland. The Irish Wolfhound was depicted in the stories of battles with Finn MacCool (spelling varies) and the Fianna. Culann (sp) killed a great dog which may have been an Irish Wolfhound and was from henceforth known as Cuchulainn(sp) which means “The Hound of Culann”. Cuchulainn was a great Irish hero of Ulster known for his size, strength, loyalty, and battle prowess – all the features of the Irish Wolfhound. For more great historical information on the Irish Wolfhound, visit http://www.irishwolfhounds.org/history.htm. In generally, only chieftains and other Irish nobility had been permitted to own an Irish Wolfhound. The Irish Wolfhound was prized for his ability to hunt wolves and large game. Not only were they good in the hunt, but they also made great pets. Even today, the Irish Wolfhound makes an ideal family pet. He is good with children and other pets. He is generally calm, good-natured, and easy-going. Despite his amiable nature, the Irish Wolfhound makes a good guard dog. He is reserved with strangers and will hold his ground against intruders. And unlike some guard dog breeds, he is not eager to attack and bite unless no other options are left to him. Other than enormous food requirements, caring for an Irish Wolfhound is relatively easy. Since they have a calm nature, the Irish Wolfhound needs nothing more than a big yard and occasional long easy walks. For grooming, the rough medium-length hair of the Irish Wolfhound needs regular brushing. But hair trimming or stripping of the fur is not necessary. The Irish Wolfhound is often pictured in a gray or fawn color but they also come in brindle, red, black, or even a pure white. Since the Irish Wolfhound was bred with the Scottish Deerhound in the late 1800’s in an attempt to revive the nearly extinct breed, the Irish Wolfhound also comes in Scottish Deerhound colors such as dark blue-gray and gray brindle. An Irish Wolfhound who is at least 18 months old should stand between 30″ and 32″ tall and weigh between 105 and 120 pounds. He has a long body, neck, and head, and along moderately pointed nose. Adversely, the folded ears of an Irish Wolfhound are small and short. 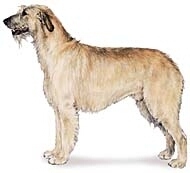 The Irish Wolfhound is in the AKC Hound Group. The hound group, in turn, is divided into two types of hounds – scent and sight hounds. Scent hounds like the Bloodhound, Basset Hound, and Beagle have a great sense of smell and may have a tendency to wander. Sight hounds, on the other hand, have a not-so-great sense of smell but excellent eyesight. 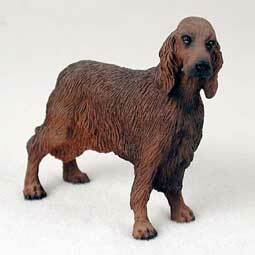 Sight hounds include the Greyhound, Afghan Hound, and the Irish Wolfhound. As a whole, most types of hound dogs, including the Irish Wolfhound, tend to be independent and require careful training. Positive reinforcement with a tempting toy or treat as a reward generally works better than any forceful or compulsive type of training. Sadly, the average life span of the Irish Wolfhound is only 5 to 7 years. And as with many large breed dogs, they are prone to gastric torsion and hip dysplasia, and even elbow dysplasia. Other types of health problems associated with the Irish Wolfhound include heart problems and bone cancer. If you are considering purchasing an Irish Wolfhound, make sure the breeder has done tests for hip dysplasia and for the heart. Our sources for this article include the website mentioned above, Wikipedia, the AKC website, and “The Dog Breed Bible” by D. Caroline Coile, PH.D. Looking for a New Veterinarian for Your Dog?